Named, of course, after Sally from Cars (we vetoed Lightning McQueen & Buzz Lightyear as options). Our miniature dachshund, Josie, has kind of adopted Sally and has spent quite a bit of time cleaning her. I’ll have to take some video of them playing together to show y’all! We also got to spend time with my family this weekend, celebrating family birthdays and hanging out. It was a fun weekend for all of us! My brother is back out here for college, which of course is great because that means we get to see him more! I don’t know that I’ve ever had steak for breakfast before, but this was great! It was another one of those meals that didn’t look like a ton on the plate, but was really filling. 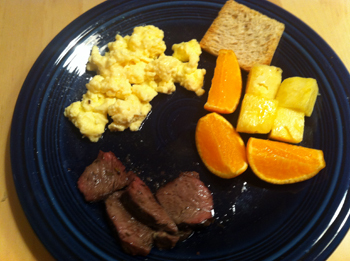 The steak was tender and the eggs were cooked just how I like them. The toast was more like a crouton, but was provided crispiness and seemed to round out the meal. And of course, fruit! Can’t go wrong with that. I know I was supposed to eat the salad with the sausage, but for me keeping the elements separate fit more to my tastes. The sausage was spicy and flavorful, and I enjoyed it (which is saying a lot for someone who doesn’t really like sausage very much!). I wasn’t a huge fan of the salad dressing so I ended up just picking at the salad, but I still felt satisfied and wasn’t hungry throughout the afternoon. 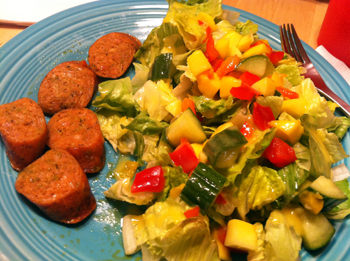 I love the concept of this salad, because the sweetness of the mango and the coolness of the cucumber really balance the spiciness of the sausage. This one was outside of my food comfort zone, for sure. 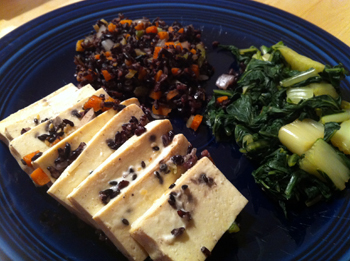 I’ve never tried tofu before, and I have to admit I have a preconceived perception that it’s, well… gross. I was determined to try it, though. The texture was softer than I expected; a little softer than the white of a hard-boiled egg, if that makes sense. It was really mildly flavored, so not too bad at all. That being said, this is a meal I wouldn’t pick to eat again solely because it doesn’t fit my specific tastes. 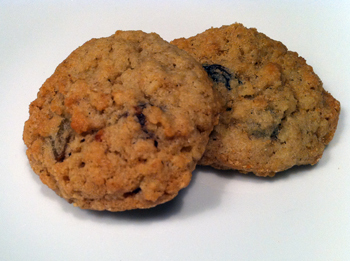 Great, tender cookies packed with a lot of flavor! They’re smaller – about the size of Oreos – but in having two it felt like a substantial dessert. 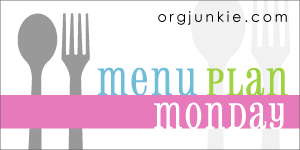 Monday: Pasta that we didn’t end up having this past week. 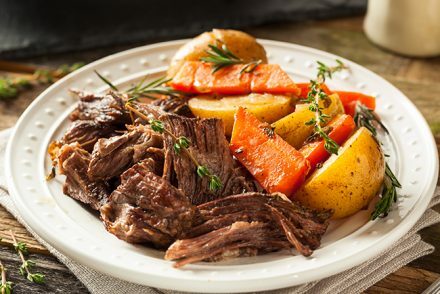 I’ll sautee some carrots and we have leftover garlic bread to go with it. This meal won’t take long to prepare, which is good because J has gymnastics class. Tuesday: We’re babysitting our friends’ girls plus C has his first gymnastics class, so we’re doing Chick Fil A for dinner. Thursday: Grilled cheese sandwiches and tomato basil soup, and raw veggies to snack on with it. Friday: Breakfast for dinner! We’re doing our breakfast in a biscuit, which we’ve affectionately renamed Breakfast Cupcakes. 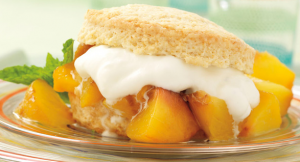 Don’t forget to check out Weber’s Grilling Recipe of the Week – Peach Shortcakes! I love this because I never think about doing dessert on the grill – and this sounds soooo good! Welcome to the wonderfulbworld of golden retrievers! I currently have 4 a y/o and an almost 10 y/o. (the 10 y/o is the doonmeister in my online ‘handle) These two are the six and seventh goldens I have had in my life. (no, I am not that old, I usually have, at least two, all the time about the same age). They are absolutely wonderful dogs. They are great with children-one time, when she was very little, my grandniece came to house, saw one of our goldens, ran up and grabbed him, causing them to both fall down. Merlin just wagged his tail. They do get to be good size and can move VERY FAST -35 MPH in short bursts. So you have to keep an eye on them. The size may upset some people. The Dyson vacuum cleaner is the official golden retriever vauum cleaner. You will understand immediately after first spring-when your golden starts to ‘blow’ their winter undercoat!!! Congradulations!!! You will be a great goldener in a couple of weeks! Thanks, Mike! It’s great to hear of your good experiences with them. Since my boys are just 2 & 4, it was really important for us to get a dog that was family friendly. We also have a miniature dachshund that has taken to our new addition really well. So cute. My neighbor has a golden. He has the best temperament and is great with kids. 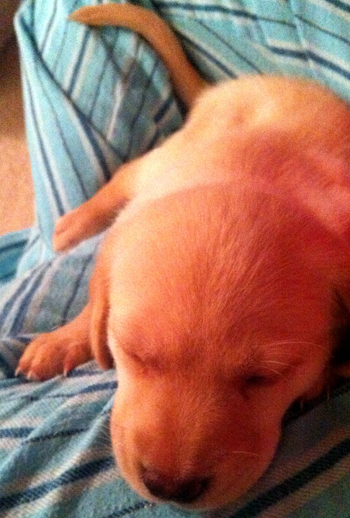 That is a cute cute puppy!!!!! stopping by from xenia’s and am now GFC following you. loved for you to follow me back! I joined the Friendly Friday Blog hop!